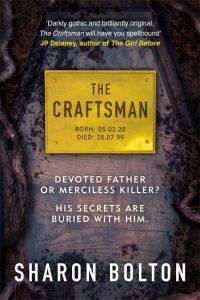 The Craftsman opens in August 1999, the hottest day of the year. Assistant Commissioner Florence Lovelady attends the burial of Larry Glassbrook, a coffin-maker. He’s also the convicted serial killer whom she arrested thirty years earlier. A master carpenter and funeral director, Larry imprisoned his victims – alive – in caskets he made himself. Clay effigies entombed with their bodies suggested a motive beyond the worst human depravity. 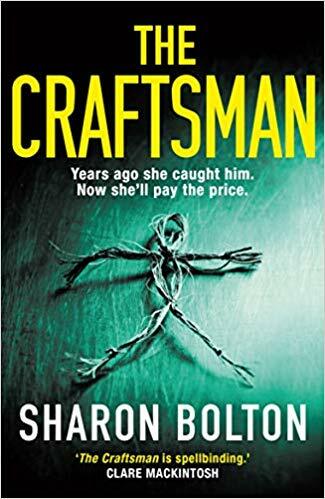 Sharon Bolton’s mysteries have always leaned towards to gothic, and The Craftsman is no exception: Glassbrook’s burial is witnessed by families and friends who mourn his victims, reporters hoping to wring one final headline from the tragedy – and the dead. High on the Lancashire moors in the shadow of Pendle Hill, The Pendle Witch Trials, secret covens, and the dark arts act as chilling backdrop to the murders of teenaged children in this gripping and suspenseful story. AC Lovelady built her career on Glassbrook’s arrest and conviction, and she’s still haunted by those deaths, so when Lovelady finds an effigy of herself, she begins to question if she was wrong all those years ago, and fears she is the next target. Bolton packs the story with clever misdirects and false leads, yet always plays fair with the reader, and this unconventional story will keep you guessing to the end. Splinter In The Blood by Ashley Dyer is available in most formats now. Links to buy online in the US and UK are just a click away!